This course is part of a joint initiative by BCM Institute and SkillsFuture Singapore (SSG). It is the second in a three-part series SSG WSQ BCM courses. 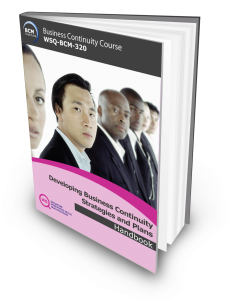 This second WSQ business continuity management (BCM) course is a follow up to the assessing risk and business impact requirement course. This course teaches participants the know-how of developing business continuity strategies and plans. It is thus a pre-requisite to compete the BCM-310 course before registering for this course. * Completion of all three workshops (i.e. BCM-310 Assessing Risk and Business Impact Requirements, BCM-320 Developing Business Continuity Strategies and Plans and BCM-330 Testing and Exercising Business Continuity Plans), make payment towards attending the Qualifying Business Continuity Certified Specialist (BCCS) Examination @ SGD200, pass the exam and send in your application form to attain the internationally recognised BCCS certification. NOTE: Singaporean and Singaporean PR participants in the Singapore course would also be getting a Statement of Attainment from the Workplace Development Authority at the completion of workshop and assessment. NOTE: It is advisable that the course BCM-310 Assessing Risk and Business Impact Analysis be done consecutively with BCM-320 Developing Business Continuity Strategies and Plans as BCM-310 forms the basis and foundation for the understanding of BCM-320.